Functional evaluation is an important component of cardiovascular imaging, contributing to diagnosis, management, and prognosis. Echocardiography and cardiovascular magnetic resonance (CMR) are the most commonly used techniques for cardiac functional evaluation. Cardiac CT, which is primarily used in the evaluation of coronary arteries, is a reliable alternative in the evaluation of cardiac function, particularly in circumstances where echocardiography does not provide adequate information or CMR cannot be performed due to contraindications or artifacts. Functional evaluation with cardiac CT requires retrospective ECG gating, which allows reconstruction of multiple phases of the cardiac cycle. Cine images can then be reconstructed in multiple planes which are used for qualitative assessment of global and regional cardiac function. Quantification of ventricular volumes, mass, and function can be obtained by either drawing endocardial and epicardial contours or using threshold-based segmentation technique in end-diastolic and end-systolic phases. Global and regional ventricular functional abnormalities are seen in a variety of cardiomyopathies, including ischemic heart disease, nonischemic cardiomyopathies, pulmonary embolism, and congenital heart diseases. CT quantification of the left atrial volumes and function can also be performed in atrial fibrillation and mitral disease. 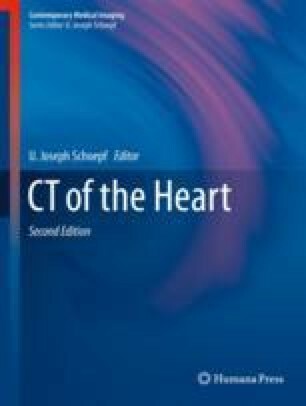 In this chapter, we review the role and technique of CT in the evaluation of ventricular and atrial function.